Bangalore-based custom automotive tuner, Race Concepts has come launched a new full-exhaust system for the Yamaha R3. The custom exhaust increases power by 3 hp and torque by 2.1 Nm at the wheel. Race Concepts has developed a custom full-exhaust system for the Yamaha R3. The power gain is without any other performance mods. 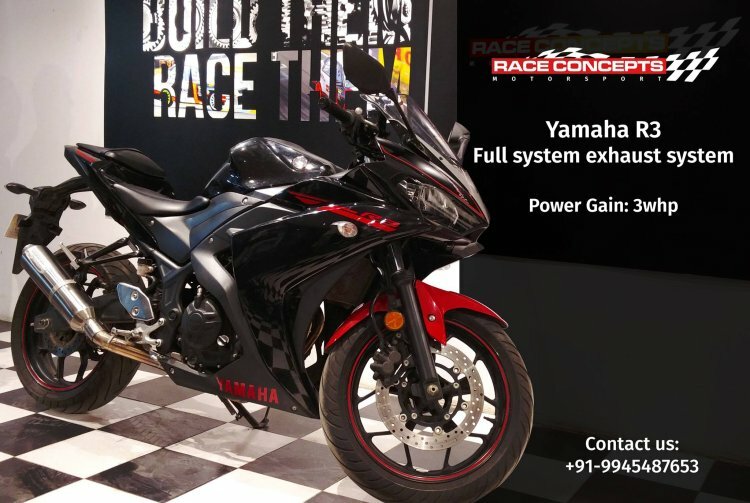 The stock Yamaha R3 develops 31.9 hp of power and 21.4 Nm of torque at the wheel, while the motorcycle with the custom Race Concepts exhaust generates 34.9 hp of maximum power and 23.5 Nm of peak torque at the wheel. 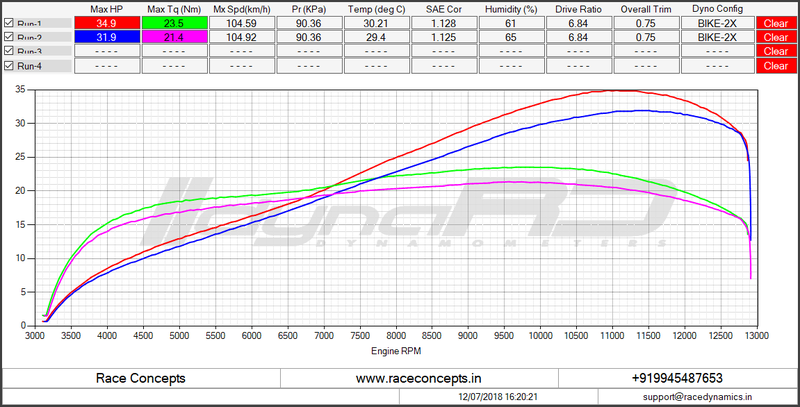 The power figures are dyno-tested and develop across a broader range of rpm. The Yamaha R3 sources power from a 321 cc, 4-stroke, DOHC, parallel twin engine that comes mated to a 6-speed gearbox. The motor develops 42 PS of maximum power at 10,750 rpm and 29.6 Nm of peak torque at 9,000 rpm at the crank. However, the dyno-tested figures mentioned above look smaller as there is a significant amount of loss of power during transmission. Considering the 10 percent increase in power because of the full exhaust system, we can safely assume that the custom Yamaha R3 develops close to 46 PS of power and 32.5 Nm of peak torque at the crank. That said, Race Concepts has only revealed the increased power figures at the wheel, and the number mentioned above is a rough estimation. As a reminder, the company launched the 2018 Yamaha R3 in India at the Auto Expo 2018, priced at INR 3.48 lakh (ex-showroom, Delhi). Updates include revised cosmetics, an introduction of standard dual-channel ABS and high-performance Metzeler Sportec M5 tires. The Yamaha YZF-R3 rivals the Kawasaki Ninja 400, TVS Apache RR 310, KTM RC 390, and the Benelli 302R in the domestic market. The dyno-tested Yamaha R3 with Race Concepts full-exhaust performance figures. The motorcycle gets a power gain of roughly 10 percent. The motorcycle features a digital-analogue instrument cluster, telescopic front forks, and a linkage-type adjustable rear mono-shock. Braking force comes from 298 mm front disc and a 220 mm rear rotor, while ABS is standard. The Yamaha R3 gets a fuel tank capacity of 14 litres. According to several media reports, Yamaha is developing the next-generation 2019 Yamaha R25/R3 that could debut at GIIAS 2018.